HartyHarHar: Six String Heroes is 5, too! WE ARE STILL finding pieces of guitar in the parking lot next door. It took most of Monday morning to put the store back together. I just found a tiny plastic bottle by the sink. Yup .... we still have our five-year anniversary party on the brain. So let's also wish a happy fifth birthday to Kevin Sullivan, Steve Stoner and the rest of the gang from Six String Heroes at Jefferson Barracks. Second String Music and Vancil Performing arts are proud to be a part of the Quincy chapter, and the girls from Blue Cross/Blue Shield in Quincy have been huge supporters. It's the power and healing of music. 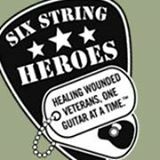 Six String Heroes has helped more than 500 veterans experience that healing and power. I will never forget meeting with Kevin and Steve to get the Quincy chapter going. During a store party, and it might have been the first anniversary bash four years ago, a veteran walked in and it became obvious he had some serious issues. We got him started in the program that day and playing the guitar helped this man a lot, and possibly saved his life. So happy birthday, Six String Heroes! I don't think it's coincidence we are both five and doing well. Cheers to us and to many more years.